As mentioned in my last post, leks are a type of mating system that kakapos exhibit, that isn’t limited to birds. Copadichromis eucinostomus [a type of fish], hammerhead bats, etc. exhibit lekking too. It involves male-male competition for status and the right to mate with females. There are no resources at stake for the male to protect so the female’s decision is based heavily on the male’s display techniques and the territory on which he displays. Because of this, one male is usually getting a vast majority of the mating opportunities. Since the male is so busy courting as many females as possible, the female must care for her own offspring. To make her load slightly easier, lekking birds usually have precocial young or are frugivorous or nectivorous. Another lekking bird (not sure which type of lek) is the Screaming Piha. At the Baltimore Aquarium one day, for a friend’s niece’s birthday, we were wandering around when we heard the call featured in the video below. Super attractive if you’re a female Screaming Piha, eh? Most of you are probably thinking, “What in the world is a kakapo?”. Kakapos are a flightless, nocturnal species of parrot, endemic to New Zealand, that can weigh up to 8 lbs. They are critically endangered, due in part to the influx of humans and predators in a region that previously had none, leaving the birds no time to adapt defenses. 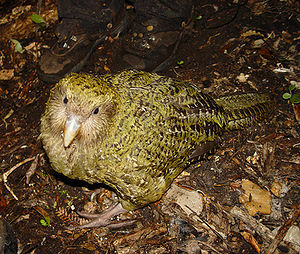 (Kakapo decline). They also have the odd habit of staying completely still, hoping to blend in to the environment when they sense a disturbance. (Kakapo Behavior). In their recovery efforts, the Kakapo Recovery Programme has found rats to be an issue in chick survival rates (Turning the Tide). Their herbivorous diet most likely plays a part in their low basal metabolic rate. When key food items are abundant, kakapos will feed on them almost exclusively. Due to their extremely low population, kakapo diets are supplemented with a pellet food to help boost egg production and reproductive health. (Kakapo Feeding). If you’d like to help save this rare parrot whose numbers are currently at 131, you can click here!